Why wait for a lesson? 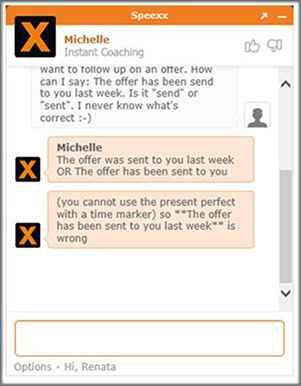 Speexx instant coaching offers your workforce the real-time language feedback they need to get their jobs done. Certified trainers are available 24/7 to cover all of your employees’ linguistic and learning questions. INSTANT COACHING can make your employees more effective. I am interested in learning more about your Instant Coaching service.